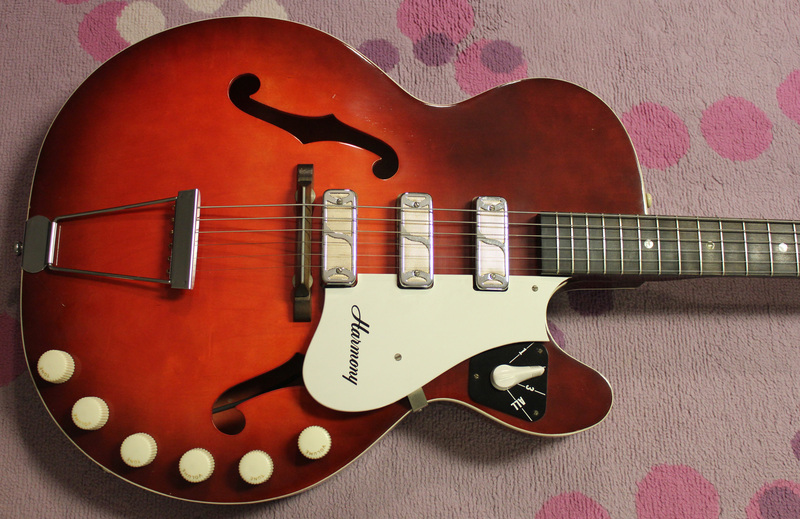 “A Perfectly Good Guitar” -1963 Harmony Rocket H59 – Drowning in Guitars! Sort of buried on page 6 of the 1960 Harmony catalog, sat a new line of thin cutaway guitars that I just LOVE. The Harmony Rocket series guitars had a pretty good run from 1960 to about 1967. These were sort-of bare bones rock machines aimed at the intermediate to beginner guitarist, and they just flat out BALL!!! Originally, all the Rockets came in sunburst, but in 1963 the redburst guitars became available, and this one right here is from that first run of reds. By 1966 the pickups changed and a truss rod was in the neck, but alas, those changes would be short lived as the Rocket series would soon be put on the shelf, and the Harmony company would stagger into the 1970s before finally closing the proverbial doors for good in 1975. But for now, let’s get back to the early 60s. The Beatles had landed in America, most every kid in the USA wants an electric guitar, and the Harmony Company churns out more instruments than anyone! Salad days! These Rockets were often called the “poor man’s Switchmaster”, referring to the Gibson ES-5 high end jazz guitar. Of course, this semi-comparible Harmony version could be had for $135.50 in 1960 and the price only rose slightly over the years to $154.50 in 1964. 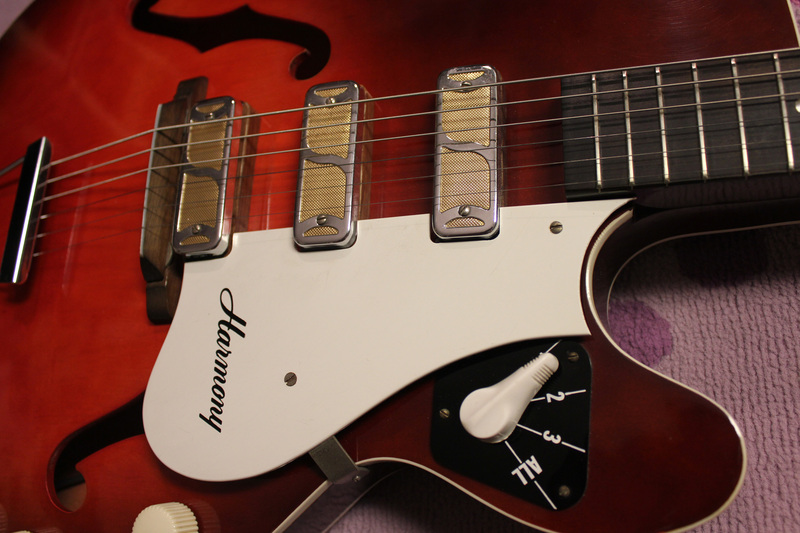 Harmony had guitars for just about every price range, and priced guitars according to features like neck inlays, hardware, and adornments (like headstock overlays). But the badass Rocket featured a stripped down style and more knobs than an oven! Now if you’ve been reading my posts, you’ve probably figured out that I just love masonite, plastic, and plywood, but these Rockets sport some nice features for a “beginner’s” guitar. Really, the Rockets are just my style. They’re built pretty well for mass produced instruments, and even though the DeArmond “Indox” pickups were cheap (cost-wise) pickups, they still hold up to any music you can throw at ’em! In fact, my favorite pickups of all time are the various 50s/60s DeArmonds and Valcos. Hands down! These little Indox pups are hot as hell and all read out in the 9k-10k range! The guitar itself is only about 2″ deep but it is fully hollow, and the pickups are so hot the guitar just wants to take off when any bit of dirt is introduced to the mix. And I just dig instruments that are on the verge of exploding at any moment! All hardware and components are of good American quality and hold up well over the years. This Rocket doesn’t have a truss rod, but it does have a robust neck which is proudly “Steel Reinforced.” The 1960 catalog describes the necks as “Ultra-Slim”, but most players today might find them pretty darn chunky! The neck isn’t very wide though, it just fills the palm if that makes any sense. This particular guitar I bought from Dave D’Amelio (aka Dano) a few years back. He has a HUGE guitar collection and had a few Harmony guitars in the stable. He used to have this Rocket hanging in his shop and every time I went over there I’d bug him to borrow it! All those cupcake knobs and gold pickups just spoke to me, like PLAY ME!!! And that’s what I do! It’s always a joy to buy one of Dano’s guitars because he just dials these suckers in! This one came in the original case and was barely played in the 50 odd years it’s been around. What’s nice about most Harmony guitars is that the company made SO MANY GUITARS! I’d bet Harmony outproduced Gisbon and Fender COMBINED in any given year or month in the 1960s. If you see a Harmony at a high price, just wait around and you’ll see another soon enough at a lower price. Many guitar stores seem to think some Harmony guitars should cost as much as a comparable Gibson or Fender, and that’s just delusional. Guitars like Harmony, Danelectro, and Kay, were built in such huge quantities that they can still be had for bargains here and there. And that’s the way it should be! So getting back to why I love these guitars, it’s mostly because I think it speaks to the American industry of the post war era that these guitars all stand the test of time. Even mass-produced guitars of the 60s were built way better than many of the guitars that would come out of the 1970s and 80s. At least in my opinion. There are several Harmony guitars that have become collectible and command prices in the thousands, but the humble Rockets can still be had for well under $1000 and have all the sound you’ll ever need. Don’t believe me? Then check out Mike Dugan ripping away on mine! I’m glad you enjoyed the article!! These guitars are more than just wood and wire to people. And I like how you say it’s a “perfectly good guitar.” I’d like to add that to the title, if it’s OK with you? His momma wouldn’t buy him That new red harmony”. I have an old two pickup Rocket. Can’t play it, the neck is warped. Any idea where to get a replacement neck? A luthier told me he thought a licensing issue might be the reason I can’t find one. Nah, these necks are always salvageable with a good tech and a heat press…. Absolutely and thanks for the heat press idea. S-65 serial#2795H54-1 Harmony Rocket in case,never played org/strings,org/picks,note stickers still on neck,w/amp. He, he. This pretty much says it all I reckon. …” the pickups are so hot the guitar just wants to take off when any bit of dirt is introduced to the mix. And I just dig instruments that are on the verge of exploding at any moment! We don’t see too many Harmonies downunder. I own an H75 and a Silvertone 1446. And like the description of the Rocket says you can launch these into the stratosphere with a just a strum. Replacement pick guards are all over the place. Talk to a tech at your local, quality, guitar shop and they can get one for around US$25.00. I just bought a ’69 H53/1 in Milwaukee from a shop. They replaced the adjustable bridge and white pick guard (with Harmony logo). It needed a cleaning, and one of the pots needed a cleaning, but otherwise it’s a blast. The “mustache”, foil pick-up offers great tone, and screams when I want it. I’ve showed it to a couple of friends,and have had offers made on it. They, at least mine, was not appreciated (or respected when new; mine had some paint splatters on it from a previous owner painting their living-room), but it’s found an appreciative owner. I may own better, or more expensive guitars in my future, but I doubt it I’ll own one that is so much fun and has soooo much soouuull. Harmony Guitars are beautiful!! That was some great playing!! Thanks. I thought the reissues were pricey, but if you look around on the used market you’ll eventually find one. I love Harmony Rockets! I have one I got from a pawn shop in 1982 in Saginaw, Michigan. I named her Marilyn. I have acquired a two other Rockets, since. I also have two other Harmony branded guitars that my girlfriend got for me. Marilyn is a little bit battered, but she works perfectly. The other Harmonys are in pretty much mint condition. I also have Sears Silvertone amplifiers, model 1484; one is battered, but works, and the other two are in mint condition. I love the sound of playing the Rockets through the Silvertones! I recently got a Silvertone 1454 (same model as single cutaway Harmony H78) does anyone know if this is the same body shape as the Rocket and/or if there is a hardshell case that would fit it? I’ve heard Gretsch cases because of the size of the headstock, and also I’ve heard a Guardian full depth archtop case might work. Any advice? Thanks! I couldn’t say for sure, but maybe someone else can chime in regarding the size? I use an Epiphone hard case, but I do have to fold down the guitar-neck brace inside the case so that the guitar can fit; mini-modification. I do have a couple of the original Harmony Rocket cases, in decent shape, but they’re so old that I wouldn’t carry them by the handles because I’m afraid that the handles might come off. 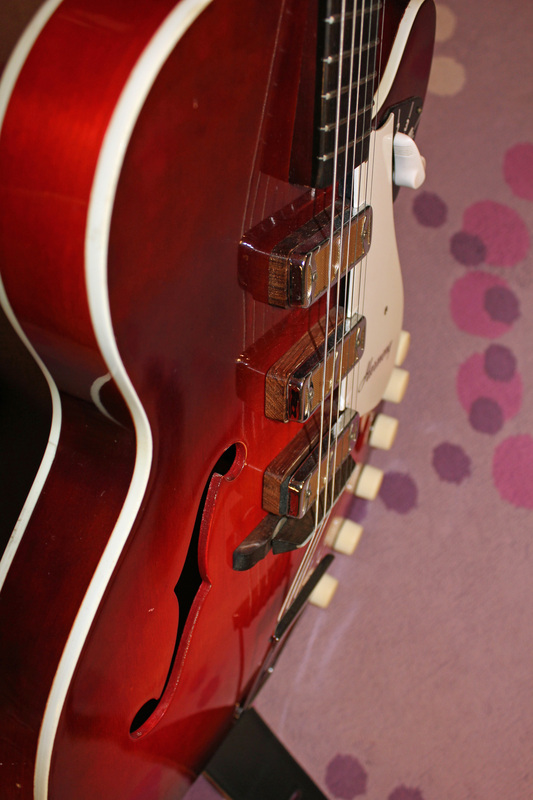 I want to buy more Epiphone cases, unless I find more suitable cases for my Harmonys. Hope this helps. I have and old H53 Rocket and it fits in a jumbo acoustic case, for like a Gibson advance jumbo slope shoulder flat top guitar. I just happened to try it and it went in perfect. My very first electric guitar was the same red burst three pickup steel re enforced neck . I got it in 1963 . I played it for 5 years and it was a great guitar . I did feel the two pickup model looked a bit better , never cared for that huge switch and all the white knobs. It was a great guitar and never gave me one problem . I bought it from Roselle school of music in IL It sounded great even without an amp for the late night playing so not to wake the parents. hi, wich string gauge do u use? I just got a 1967 Harmony Rocket, it was my Grandfather’s, but he passed away, and it was given to me because I’m the only one who plays in my family, but the pots that are in it, are the original ones, and I wasn’t sure if you could help me out on which ones to replace it with, I know they are single coils, so probably 250k, but they aren’t like modern single coils so I wasn’t sure if you had a specific set that you’d recommend, I plan on replacing the two volume and the two pots, but keep the pickup selector. If you could help me out that would mean a lot! Hmm, I think these would’ve had CTS 250k or 500k originally… probably couldn’t go wrong with either set because these are hot single coils!